Now available for pre-order in our lovely shop is the utterly divine session recently laid down for Latitudes by Chelsea Wolfe and band. And what a supremely charming bunch of people they were to have as guests. Chelsea and her band brought a unique personal take to the songs of the one and only Rudimentary Peni for this session, and it's truly an extraordinary performance that we are delighted to bring to you. Chelsea Wolfe is one of those artists who presents an environment rather than a show or an album - a tangible world to step into. On first being tipped off to her work, it was the marriage of visuals and music that stuck us as phenomenal. The overwhelmingly positive response from Chelsea to our invitation was humbling. As was her choice of material - a series of cover versions from a band whose history is a part of the very fabric of Southern - Rudimentary Peni. The opportunity to hear a contemporary artist who we respect recording material in the same studio and with the same engineer where the originals were laid down by one of our most prestigious and unique acts seemed like synchronicity itself. We were profoundly flattered. What makes the situation all the more incredible is that it wasn't until Chelsea and the band were actually in the studio that we discovered that they were unaware of the link between the space we were standing in and songs they were about to perform. So a remarkably happy accident became a miraculous concurrence. One we are very honoured to present to you. As if being in the studio where Rudimenary Peni have recorded all of their albums was not enough, we had to go one step further and ask the band's Nick Blinko if he would illustrate the cover of the release for us. And he has not disappointed. It’s important to know that since Ms Wolfe released her debut album The Grime And The Glow, she has instantly become the centre of attention, and if one were to ever elude her notorious gravitas, many would go out of their way to quickly rectify your experience. 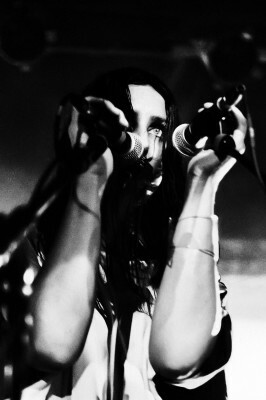 Such to say, Chelsea Wolfe has made quite an impact in the last few years, following up with a critically acclaimed second album, Apokalypsis, and more recently a full-length live offering from her staggering performance at Roadburn 2012. Her music explores the mind, meant for after-hours as dark melodious passages and haunting vocals fill the room; yet somehow these hypnotic soundscapes manage to hold their own while buried deep under well crafted songwriting. To discover that she is such a fan of Rudimentary Peni made absolute sense to us. You can pre-order the CD and Vinyl now from our shop. We also have a special pre-order only bundle which includes an exclusive t-shirt adorned with the cover art, and your choice of vinyl (£28) or CD (£22). The bundle will only be available to order until 20th October so do not delay.